We need your help. 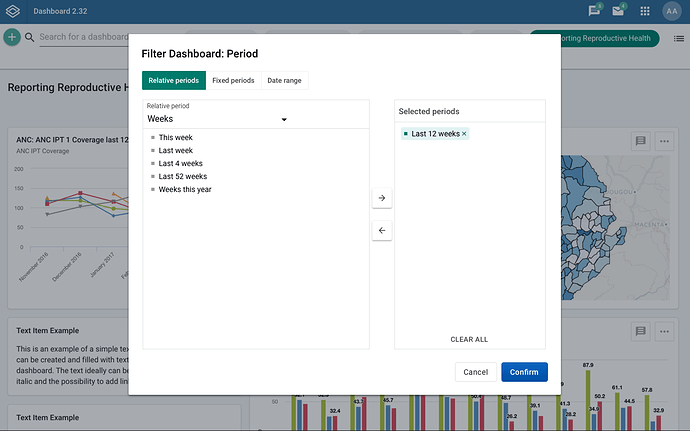 We are planning to begin working on new global dashboard filters/views for period, org units, org unit groups, option group sets, and category option group sets. Essentially, the same disaggregations that are available in the other analytics apps will be able to be applied to a dashboard. 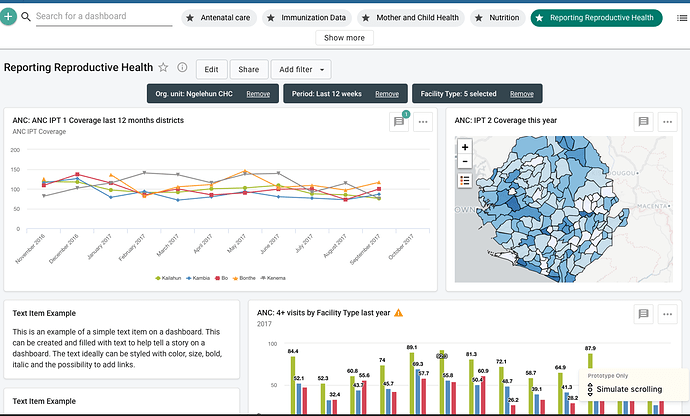 This functionality is long requested, and it will be a major improvement to dhis2 dashboards. We have developed a mock-up for this. Here. This is not a functional instance of dhis2. It is just a simple mock-up with only a few click options, but it will be what we use to develop the real thing. Please have a look and give us your thoughts in the comments to this post on what you like, what you do not like, what you think we should change, or if you have any questions about it. FYI, the period view editor will apply to all dashboard items regardless of their predefined period. We are saying “changing the dashboard view” because it is not truly filtering anything. It is just changing the data you are viewing based upon revised dimensions. If your interested the jira ticket is DHIS2-4884. Hi Scott, thanks for the opportunity to contribute. Looks to be exciting new functionality. To expand… For a single report, we can have users set to access our top level global org unit (to see overview of all countries in the world), right down to users that only have access to see a single org unit. with user 0 assigned global org unit, user 1 to country 1, user 2 to country 2. We cannot have a common dashboard/report set to global (so that user 0 sees a consolidated view, user 1 and 2 see their respective countries), because the user with country 1 gets an error saying they do not have access to country 2, and vice versa. Instead we have to maintain multiple copies of the report, which can get messy, and duplicates work when updates are needed (doesn’t sound that bad in the 2 country example, but you can imagine with hundreds of users / thousands of org units, this can get tricky!). Is there any scope to improve the org unit filter so that it can render a subset of the org units selected, dependent on your user access? Really neat would be if a user could filter by org unit level on the dashboards (like they can in the org unit filter in the analytics apps). In effect, being able to aggregate their dashboard on the fly. 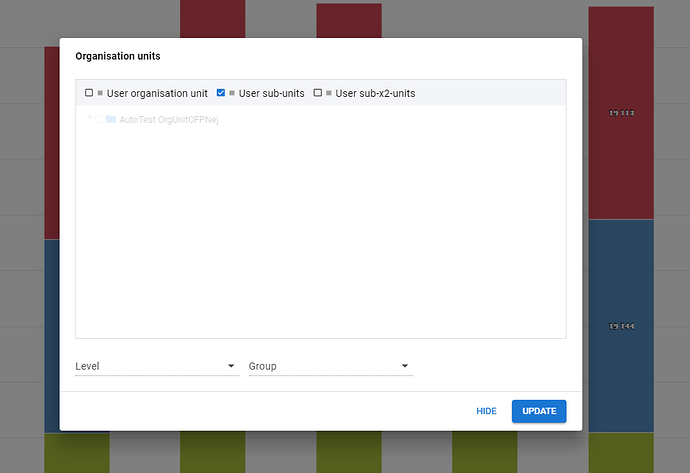 PS – I see from your mock up you’re already looking to add org unit group filters – looks awesome! The New UI looks great! (UX suggestion) With the introduction of the much appreciated filters (called slicers in PowerBI), into the dashboards, i believe that the top section is becoming very crowded and is almost taking more than 25% of the total height of the screen: taking into consideration the “other dashboards” viewer and the top menu bar. Maybe put these 2 new buttons in the top menu or on the right/left side discretely hovering on top of the other items. Maybe also toggle the top menu bar. I find @david.palmer.msi 's suggestion of showing a subset of the main data of a report/dashboard (which the user has access to) extremely useful, since it really makes our lives easier; though it primarily affects reports/visualizers but also dashboards. so instead of showing an error, show only the subset of data the user can see with a caveat message at the top saying something similar: “You are only viewing a subset of the data due to your access rights”. Is there a way to make the dashboard items take 2 vertical spaces the same way they could take 2-3 horizontal spaces? Thanks Scott, very welcome new functionality. I agree with the two comments made so far by Dave and Bernard. Looking forward to seeing new iterations of this and to see it coming to production soon! Hi Dave, Thank you very much for the detailed response. I really like your suggestions to include filtering by org unit level. I could see this being very useful, and we’ve added this to the roadmap. We are working on a common, new org unit selector to be used across all app, and I think this would fit into that as well. We will update the mock-up to include it. On your other issue, have you tried using relative org unit selection for your dashboard items? See screenshot below. This is actually what these are intended for. Essentially if selected then they will display the org units (and their children) for what ever the user is assigned to for data capture. So in your example if you had a shared dashboard between global and country users with the “User org unit” relative org unit assignments, the user assigned to global level would see the global org unit while the user at country level would see just their country. Same dashboard item but users would only see data associated with their assignment in the org hierarchy. Does that address your concern? If it doesn’t would you mind getting on a call so we can talk though it and you can demo the issue to me? Please have a second look, and let us know what you think. We will begin working on the development of these over the 2.32 and 2.33 releases. Looking good to me, thanks very much Scott. I look forward to the filters making their way into production!